Dough sheet maker machine is use to convert large amount of dough as sheet. It uses rollers to convert dough into rectangle sheet in a continuous process. By feeding dough between 2 rollers it press the dough and convert into a length rectangular sheet. 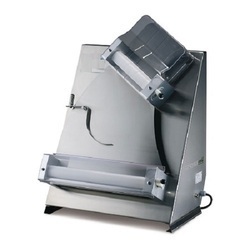 How to clean dough sheeter? Dough Sheeter Machine is a Table Top Model which is used to flatten all type of bakery doughs for preparing various receipies. They saves lot of time compared to Rolling Pins & gives consistency in quality of products. 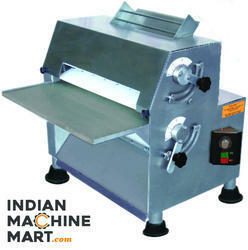 As per the varying expectations of our customers, we are engaged in offering Manual Dough Sheeter. - Heavy duty aluminum alloy head housing. - Safety guard on both side of rollers. - Easy control forward & backward by push button. We are highly acknowledged organization engaged in presenting remarkable range of Dough Sheeter. The running direction of the conveyor belts are changed easily by a handle. A Safety grid is provided to the safety of the operators. Scrapers can be removed and fixed easily without using any tool. Only minimum space is required when the machine is not in function.